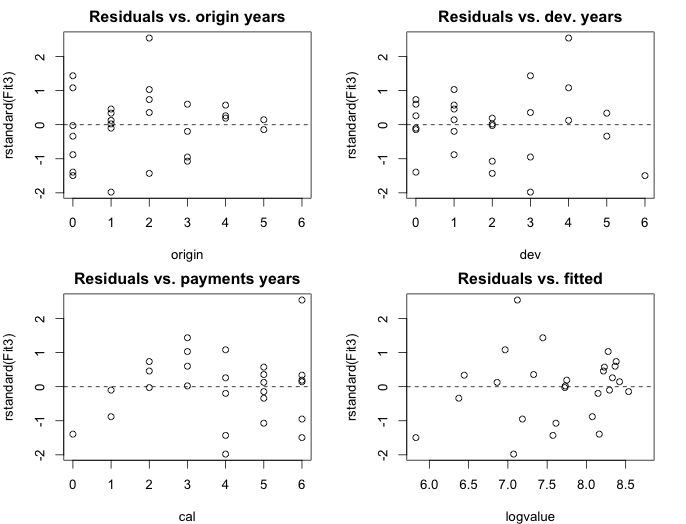 The residual plots look quite well behaved. The last payment in year 2 does appear to be a bit of an outlier and also the pattern in the payment or calendar year direction gives an indication of potential claims inflation which should be investigated further. The two models produce very similar results and it shouldn’t be much of a surprise as they are quite similar indeed. The second model has thanks to its smaller number of parameters a proportionally smaller standard error and may hence be the preferred choice. The chain ladder method provides similar forecast to the log-incremental regression model, but at the price of many more parameters. Also my estimation of the tail factor and standard error is just my wet finger in the air. Next week I will discuss sections L - M, which examine how data normalisation and claims inflation can be addressed. The log-incremental regression model provides an intuitive and elegant stochastic claims reserving model. By the way, at the time of writing Christofides noted that the calculation on a 12Mhz computer with maths co-processor took just less than two minutes(!). I wonder if the first step of the model selection process could be simplified further. In particular the aspect of finding periods of developments where the decay in claims payments could be regarded linear. Nathan Lemoine posted an interesting article on picewise linear regression using the segmented package  . An alternative might use functions of the strucchange package . Using hierarchical or multilevel models as presented by J. Guszcza  appears a natural next step for claims reserving. Thankfully Jim provides his R code as well. The Clark LDF model which Jim mentions, has already been implemented by Dan Murphy in R as part of the ChainLadder package. Lastly I wonder if the plm package  for linear models of panel data could be useful as well? As usual, you find the R code of this post as a gist on Github and feedback and comments are appreciated. Thomas Mack. 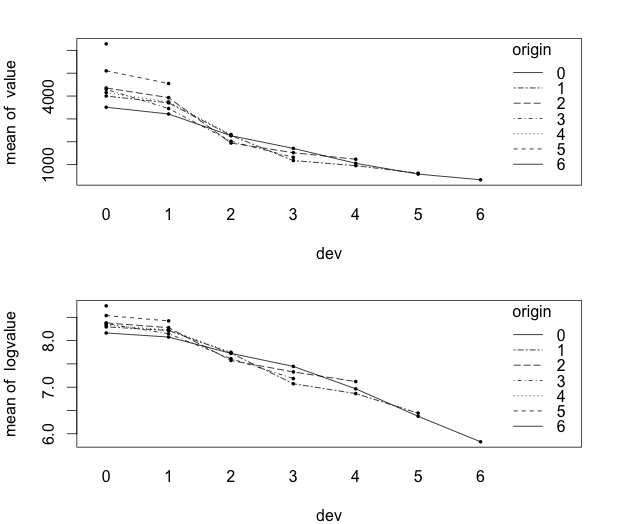 The standard error of chain ladder reserve estimates: Recursive calculation and inclusion of a tail factor. Astin Bulletin, Vol. 29(2):361 – 266, 1999. Markus Gesmann, Dan Murphy, and Wayne Zhang. ChainLadder: Mack-, Bootstrap and Munich-chain-ladder methods for insurance claims reserving, 2012. R package version 0.1.5-4. Vito M.R. Muggeo. segmented: Segmented relationships in regression models with breakpoints/changepoints estimation, 2012. R package version 0.2-9.3. Achim Zeileis, Friedrich Leisch, Kurt Hornik, Christian Kleiber. strucchange: Testing, Monitoring, and Dating Structural Changes, 2012. R package version 1.4-7. James Guszcza. Hierarchical Growth Curve Models for Loss Reserving, Fall 2008. Casualty Actuarial Society E-Forum. Yves Croissant, Giovanni Millo. plm: Linear Models for Panel Data, 2012. R package version 1.3-1.